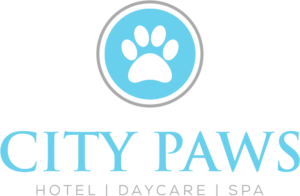 Family Fun Day – Starting March 1st 2019, City Paws will offer both Family Fun Day and Preschool on the weekends! Family Fun Day will run on Saturdays between the hours of 10am – 1pm. We will open the park to all our families that have passed assessment and have current vaccinations on file. When attending family fun day, parents must stay with their pup in the park. We ask that no treats or toys be allowed for the safety of all dogs. No Show Policy – As we reach capacity in our dog park and to ensure the best level of service for pet parents and their dogs, we ask that all cancelations be receive 48 hours prior to the day of your reservation. If we do not receive a cancellation notice, you will forfeit that day on a package or membership. If you don’t have a package or membership, you will be charged our daily rate for that day. This will also help us to accept other clients on our waitlist who would like to come. You may cancel your reservation by email, phone (612-324-PAWS), or by logging on to our online reservation portal. With us nearing capacity, please remember that our members take priority in our preschool. If you are not on the schedule with a prior appointment, we may not be able to take your dog in that day. Please also ensure that you have a ‘confirmed’ appointment prior to dropping off. Report Cards – With the growth of our facility, our staff was having a hard time creating a report card for every single dog, every day. In an effort to streamline the process and relieve our staff from the enormous amount of work, we will no longer be sending personal report cards each day. Instead, we will be creating a Shutterfly account (linked from our website) where we will mass upload photos from the day so pet parents can go on and view pictures of not only their dog, but others as well. We are looking to offer progress reports in the future, if you are wanting a report of your dog’s day. This can be an add-on feature to your dog’s preschool or lodging stay. Packed Food – If your pup eats lunch or dinner with us, please pack food in a Ziploc bags labeled with your dogs name, indicating whether the food is for lunch or dinner. Please refrain from bringing food in Tupperware, glass or other containers, as with the growth of our facility, Ziploc bags work best for the safety of the dogs and staff. Drop Off/Pick Up – In an effort to streamline preschool drop-off and pickup, we ask that you take your dog’s leash and collar with you. When dropping off your dog(s), please help assist our staff by having all clothing, boots, and harnesses removed from your dog(s) . This will make drop off & pick-up time more efficient so we can service you all in a timely manner. Dog Training – We are also planning to add training classes at night and on the weekends starting this Spring! We will keep you posted with more information to come. **Please check back here regularly for updates to our service policies.